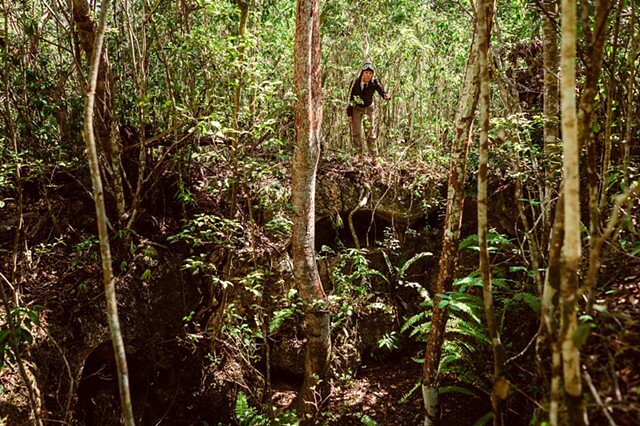 Dressed as Amelia Earhart, as if she has landed upon the hidden location of Cutler Fossil Site, the premiere archaeological place in South Florida. The Cutler Fossil Site on the Deering Estate is a sinkhole near Biscayne Bay in Palmetto Bay, Florida, south of Miami. The site has yielded bones of Pleistocene animals and bones and artifacts of Paleo-Indians and people of the Archaic period. Thousands of fossil bones found in the sinkhole represent 47 mammal species (of which 16 are extinct, and another three locally extinct), 51 bird species (seven extinct), nine reptile species, seven amphibian species, and five fish species.